Coffee and Conversations Coming Soon! Got plans for lunch on Friday? If not, you do now! 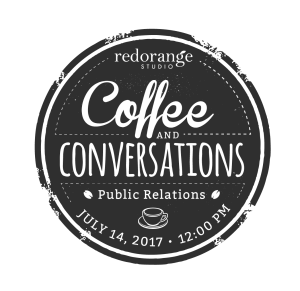 I’ll be speaking about public relations at the next installment of Coffee and Conversations, hosted by RedOrange Studios, on Friday the 14th at noon. We’ll be diving into some of my best practices when it comes to handling PR for small businesses and I guarantee that you’ll walk away with some new knowledge. You’ll learn time-saving techniques to streamline your efforts, as well as the tools that have helped me garner features in the likes of Harper’s Bazaar, Apartment Therapy, PopSugar, Brides.com, and more. For more information about the event and to register, check out the event page.